My intent was to make a holder for my bills. (Some people pay theirs at the time they arrive. I’m not one of those people.) This doubles as a napkin holder with added rings for place settings. 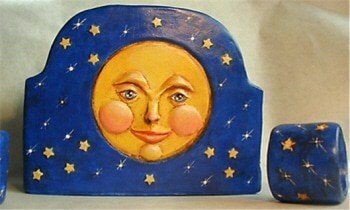 I used Paperclay for the small details; nose, lips, eye lids on this ole time grandfather style moon face. The stars are also dimensional. I used what I had on hand for most of the materials. Cost estimate is for sand paper. The Holder was created from my template drawn to easily hold those square paper napkins as well as cloth napkins. Cut from 2 layers of cardboard for substance, layered in newspaper and magazine strips. Small details on the face were molded with paper clay. Paper stars are punched from cardstock then glued and covered with multiple layers of Jonni’s gesso recipe. Napkin rings cut from empty toilet paper rolls, covered with layers of magazine pages. Acrylic paint, varnish, and lastly finishing wax for more hardness and durability. i liked, n will try.